The Mausoleum of Santa Costanza is a perfect example of early Christian architecture during the late Roman Empire, when the Christian cult had just been liberalized. Located in Rome on the Via Nomentana, this circular building belongs to a monumental complex linked to the worship of the tomb of the martyr Saint Agnes, over which two basilicas were built. The oldest of the two, dated to the fourth century, was a horseshoe-shaped basilica that eventually fell into ruins. Being too large to be refurbished, in the seventh century it was replaced by the current much smaller Basilica of Sant’Agnese fuori le Mura. According to tradition, the Mausoleum was built by Constantina for herself; the daughter of the famous Emperor Constantine I. Apparently, it also hosted the remains of her sister Helena, who died in AD 360, 6 years after Constantina. The Mausoleum does not show evident astronomical alignments but the disposition of the windows in the drum, associated with other significant features of the structure, created visible light phenomena during certain days of the year that were linked to the Saint’s feast or holy days. 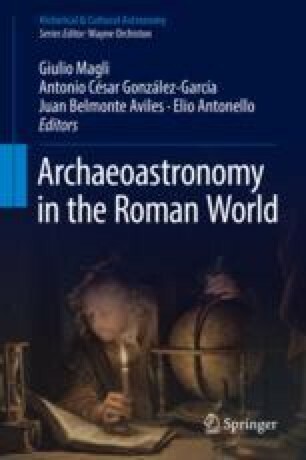 The identification of these occurrences in the monumental complex and their variations throughout the centuries are the main focus of this study, which is based on the fundamental work by Rasch and Arbeiter (Das Mausoleum der Constantina in Rom. Philipp Von Zabern, Mainz Am Rhein, 2007) where reliable plans and architectonic reconstructions are provided. The measures of the orientations were performed on satellite images and on graphic plans, assuming the average value and considering the related standard deviation as uncertainty. We would like to thank Marcello Ranieri (INAF-IAPS Roma) for review work and valuable help. Ammianus Marcellinus, XIV, 11, 6; XXI, 1, 5. Available via DIALOG. http://penelope.uchicago.edu/Thayer/e/roman/texts/ammian/home.html. Accessed 30 June 2017. Bosio, A., Severano, G., & Aringhi, P. (1659). Roma Subterranea Novissima. Collegium Graphicum, Colonia. Available via DIALOG. http://digi.ub.uni-heidelberg.de/diglit/bosio1659bd2/0095. Accessed 30 June 2017.